WARNING!!! THIS IS NOT A MOBILITY SCOOTER! It’s way too fast to be classified as one, so buyer beware. Two speeds fast and faster. 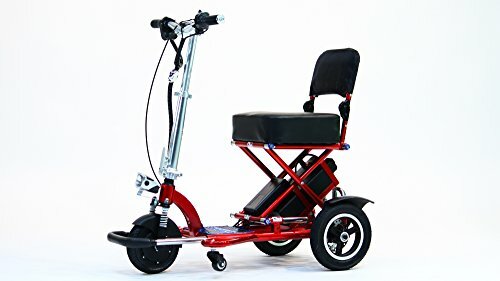 Brand New to Canada, the Triaxe Sport Scooter is portable, foldable and weighs in at only 55 lbs and that includes the 48 volt, 12 amp Lithium Battery. With speeds up to 19km/h and travel range up to 50km, this scooter that fits in the trunk of your car is like no other. Now of course hills and wind are an important factor in deciding both speed and distance travelled, along with riders weight. Now you can keep up with your dog when taking him or her for a run. Your Triaxe is durable, dependable and is ideal for RV Parks, Campgrounds, Marinas, and Shopping Centres, The Triaxe even has an optional 48 volt 6amp battery that is allowed on most airlines, so best to call ahead. Your Triaxe Sport Scooter will help extend your range, and allow you to leave the car at home, when going to the corner store, the beach or just for a leisurely stroll. This is not a mobility scooter, but more of a personal electric sport vehicle.